Nichelle Nichols, the First Lady of Star Trek, is most famous for her role as communications officer Lieutenant Uhura aboard the USS Enterprise on the popular television series and succeeding motion picture franchise, where she would eventually be promoted within Starfleet to the rank of commander. Though well known for her work on Star Trek: The Original Series, following the cancellation of the show, she would go on to work for NASA within a successful program aimed at recruiting black, minority and female personnel to the space agency, along with being an important part of the African-American Civil Rights Movement. I had the pleasure of chatting with the talented actress about her work with Star Trek and NASA, along with how she met two of the most influential African-Americans of all time, Dr. Martin Luther King Jr. and U.S. President Barack Obama. Andres: Having started off your career in music and musical theatre, how did you end up shifting gears to sci-fi, Star Trek and the role you are most famous for, Lt. Uhura? Nichelle: I had been working in Europe when my agent called me and recommended that I come home because they were doing Star Trek. I had no idea what that was because I had been in Europe for several months. He told me that I should come home because of Star Trek, to which I responded that I didn’t think so because I was finally in Europe and had been planning on staying there and was actually planning on getting an apartment there. I still wasn’t going to come home, until my agent mentioned producer Gene Roddenberry, whom I knew because he had given me my first role on his first series, The Lieutenant. I said I would come home and see if there was anything to this. But I also mentioned that after this however I would be going back to Europe and that I had decided to live there. He agreed, okay, as long as I first came home and did this. So, of course, I came home and I went in to the production office and there was this man sitting there, Gene Roddenberry. “What are you doing here?” I said. “I have a little something to do with this,” he said. Turns out that I already knew him from that prior engagement, the show ended up to be Star Trek and the rest is history. After you started on Star Trek, how did you first meet the great Dr. Martin Luther King Jr.? Well, I was at a NAACP (National Association for the Advancement of Colored People) event and I was supposed to be seated at the dais, where they had a few other stars from show business. So, as I was headed up there, one of the promoters came up and said, “Oh Ms. Nichols, before you sit down there is someone here who says he’s your greatest fan and he absolutely must meet you.” I set my purse down, got up, turned around, and there this was a man walking up to me with a big smile on his face. I immediately said to myself that whoever this fan was that wanted to meet me, and who came to get me out of my seat, he/she was just gonna have to wait, because I’m looking at the greatest man on the planet, Dr. King, who is walking towards me. With a smile on his face, he walked up to me and said, “Yes, Ms. Nichols, I am your greatest fan.” Turns out he was the one who had the promoter come and get me, and we went on to be become great friends. I went to his home to visit his family and kids on numerous occasions. Oh, they would have Uhura night haha. They’d invite friends over to watch the show, and when Star Trek would come on they would shush everyone because it was “Uhura Night” haha. When he would come to L.A., he would always call me and if I was in town or available, I would go to meet him and his traveling companions. I got to know his family and friends quite well over the years. And when he passed away his brother came to my home to tell me how etc. His lovely wife also phoned me and thanked me for the lovely telegram I had sent her and asked me to come by the day he was to be laid to rest. Several months after Dr. King’s murder, on November 22, 1968, Star Trek aired the episode ‘Plato’s Stepchildren’, which is famously cited as the first interracial kiss on American television, which you shared with William Shatner’s Captain James T. Kirk. Do you think that there was even greater significance behind that episode, considering it aired after Dr. King’s passing? I don’t know. I do know that it raised a great deal of attention and that it almost didn’t get on the air due to concerns. Many people showed concerns, but the great man himself, Gene, made it very clear that it was going on. What was shooting that scene like? Well, I think the kiss was originally written for Spock, but Bill (William) Shatner insisted that if anyone was going to get to kiss me it was going to be him, so they changed it haha. Bill was joking with me about it up until the camera started rolling. We ran through the scene and he kissed me. Immediately after we cut, the director started nervously talking him. He said, “Why did you just kiss her?” Bill said, “The. Script……It. Says. To Kiss Her……So. I Kissed. Her.” The director said, “But you really kissed her.” This went on, and so I left to my dressing room. Two suits showed up from NBC. They kept talking to the director. Finally Gene showed up and told us just to shoot two versions: one with the kiss and one without it. The whole time, Bill was still being silly and in pretending to have to take the kiss shot over and over again he’d say, “I didn’t feel right about that one. Let’s do it again.” Finally, we got to the take with no kiss. We ran through all of the dialogue and did a few takes, but Bill kept acting ridiculous through them and in that final shot, he crossed his eyes. But it wasn’t until we saw the dailies that any of us realized what he’d done. Nobody previously knew, except maybe the cameraman. Now what’s funny is that specifics were never in the original script. It just said that they kissed. No one really complained about it besides that one guy. “I disagree with you having that interracial kiss on television, but I want to say that any time a blue blooded man like Captain Kirk gets a beautiful woman in his arms like Lt. Uhura, he ain’t gonna fight it, no matter what.” Something like that. And that was the only bad review we got haha. Gene sent me a copy of that and I laughed and laughed about it. Skipping forward many years, you had the pleasure of meeting President Barack Obama. How did that all come about? The Trekker haha. He’s a big Trekkie. A lady that worked out at the White House found out that I was a big fan of the President and asked if I wanted to meet him. And after what felt like an eternity, I said YES! 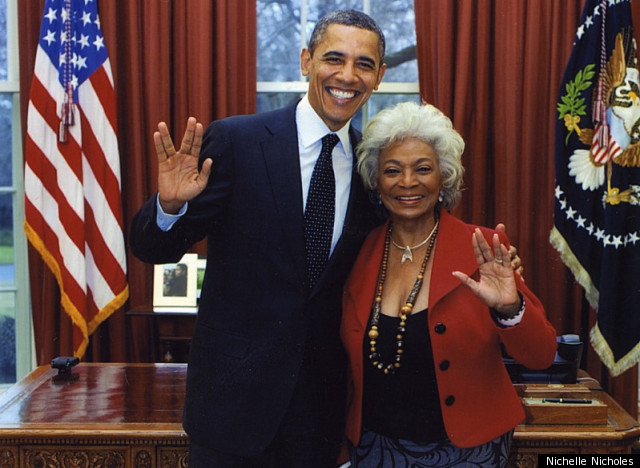 And the next thing I knew I was being invited to the White House and to the oval office and meeting the President, and he said, “You know, Nichelle Nichols, I’m big of fan of Lt. Uhura.” I brought him a big signed picture of Uhura and got a photo with the President in kind. Considering your years of involvement within the African-American Civil Rights Movement, your friendship with Dr. King, and history with NASA, how did it feel to finally see an African-American President? Oh, well I take it in stride now. I knew Dr. King. I recruited the first women and men of color for the space shuttle program. So I have a strong affinity with stuff like that and with NASA. It’s great. With the Shuttle program being terminated, do you have any thoughts on where you would like to see NASA go from here? Back to the moon and onwards to Mars. I want us to step on Mars and make our presence known there. I was just so sorry to see the shuttle program end, but I am sure it’s just a matter of time until their next step. Finally, out of all the Star Trek films you starred in, which was your favorite? Any particularly fond memories? Any in which Lt. Uhura got to step off and get away from the bridge. I loved when she got to be active and involved. I really enjoyed the entire show and movies, and am really grateful to Gene and all the cast and crew. It was simply a matter of someone saying something was impossible to do, and then Gene and us going out and doing it. They did such amazing things. Written by Andrés Markwart, a Columnist at Vancity Buzz. Connect with Andrés on Twitter @AMarkwart.